Standard - $80.99 Only 4 left! X-Large - $80.99 Only 6 left! Be warned! This costume depicts the great Palpatine as he looked after the Jedi's evil and cowardly attack, which left him twisted and forever deformed. Once a charismatic and handsome senator, and then the wise and benevolent chancellor of the Galactic Senate, Palpatine paid a terrible price for his selfless and noble efforts to bring peace to the galaxy. 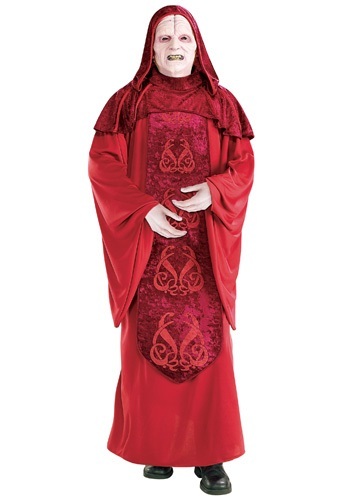 But because we pay tribute to the great master in any form he takes, this Deluxe Emperor Palpatine Costume is a great way to honor a great man! Psst. Hey! It's us. We promise we didn't get "weird," or turn to the Dark Side or anything like that. We just had to sound "loyal" to Palpatine in case the Empire was listening in on our conversation. Now that we've made it this far, we're pretty sure it's safe to speak freely. So, seriously: this is an awesome costume. Any old nerf herder could find an old dark blanket and pull it over their heads and walk around saying "Let the hate flow through you," but this sinister getup takes it a step further. With Palpatine's lush, flowing robes (as seen in Revenge of the Sith, right when he gets really evil), a cowl to hide his ghoulish features, and a grimacing, menacing mask, this costume will give you a truly Imperial (and evil) presence this Halloween! So once you've hunted down all the traitorous Jedi and swept away the remnants of the Old Republic, head out in this Deluxe Emperor Palpatine Costume and enjoy the adoration of the galactic masses!